Checkpoint Charlie was probably the most (in)famous of the border crossing points between West and East Berlin during the period of the Cold War. The original museum was already set up at this site shortly after the building of the Berlin Wall and, now much expanded, focuses on the topics of the border, escapes from the GDR and non-violent resistance movements in general. The area around the museum has also been extensively developed for tourists these days, including some heavy-handed commercialization, while no authentic trace remains at this location of the former border itself. It was here that in 1961, as the Berlin Wall was being built, American and Russian tanks had their stand-off directly facing each other. In the process of the closing-off of the border, the Eastern side had also refused the Western Allies access to East Berlin, which the four-powers agreements on the status of Berlin should have guaranteed. That understanding of the agreement could eventually be reinstated and the military provocation ended, but no attempt was made on the Western Allies' part to stop the building of the Berlin Wall as such. Too great must the dangers of escalation into a possible Third World War have seemed – the pictures of those tanks standing almost "nose to nose" accordingly went down in history as showing one of the riskiest moments in the long East-West stand-off. The name of the place, by the way, goes back to the code-naming of the three access points that the Western Allies were granted into Berlin: A (= 'Alpha' – on the transit route from West Germany to Berlin at Helmstedt-Marienborn), B (= 'Bravo' – on the outskirts of West-Berlin at Dreilinden-Drewitz) and of course C (= 'Charlie', right in the central Berlin district of Mitte at Friedrichstraße), the latter serving only Allied personnel and foreign visitors, but off-limits to Germans. Shortly after the building of the Berlin Wall was begun, one individual, Rainer Hildebrandt set up a small private museum chronicling these events and also in order to protest against the division of Germany at large. At first, the museum was in a small flat at Bernauer Straße, but it soon moved to new premises right next to the checkpoint on Friedrichstraße. Over the years it was gradually expanded and now consists of a series of separate sections (see below). The museum's founder passed away in 2004, but the museum has been continued – not always without controversy – under the auspices of his widow, Alexandra. To this day, even more than two decades after the fall of the Berlin Wall, this spot remains one of Berlin's premier tourist attractions, certainly still the No. 1 Wall-related site in the whole of the city, despite the generous 'official' memorial development at Bernauer Straße. Unfortunately this also shows in the commercialism that has grown around the site – nowhere are there more Wall-related souvenir shops and stalls that try to cash in on the lasting dark attraction of the (basically vanished) Berlin Wall. All this touristy hustle and bustle can get a bit much. But there are also serious and credible attempts at providing historical information in the area around Checkpoint Charlie. What there is to see: This is the No. 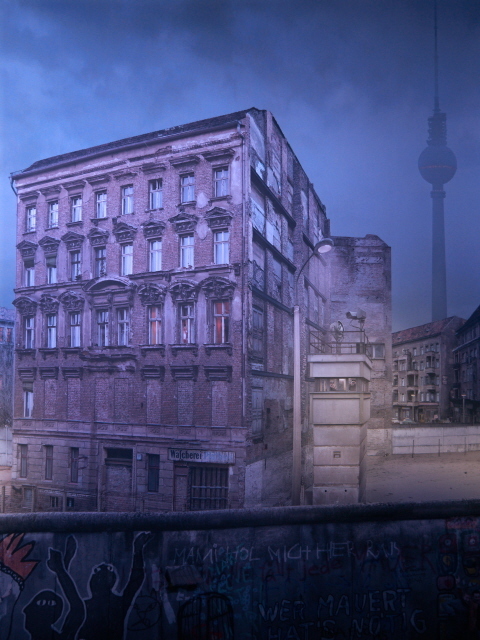 1 spot that tourists go to in search of something recalling the former Berlin Wall. And that is still so even though today virtually all authentic traces of this stretch of the border and of the former checkpoint itself have completely disappeared. To partly make up for this, replicas of the border crossing warning signs ("you are leaving the American sector") as well as a mock-up of a border checkpoint hut have been put up outside the museum. The original Western checkpoint hut can be seen at the Allied Museum. There are even equally, and more obviously, fake "border guards" on "duty" at most times, so that tourists can have their picture taken with them. The Wall museum at Checkpoint Charlie itself features a few large-scale artefacts on its façade that sport a much higher degree of authenticity. Star pieces include a GDR state logo, a segment of the Berlin Wall, and the last Soviet flag that ever flew from the Kremlin! When I saw the latter in 2010 it looked weather-beaten, frail and its red colour quite faded. On my latest return trip to Berlin, however, I suddenly found it resplendent in a fresh-looking deep red. So I am wondering whether this still is the original or a new replica instead. Inside, the permanent exhibition contains various Wall-related artefacts and documents. One 'star piece' is certainly the SM 70 spring-gun, which in 1976 had been 'stolen' from the border by Michael Gartenschläger – a former political prisoner in the GDR who after his release into the West started campaigning against the GDR's border security system. This included such risky actions as dismantling two of these deadly devices in order to make it known in the West, how inhumane the border had become. And indeed things got much worse for him: on his third attempt to dismantle such a spring-gun Stasi snipers were waiting for him and he was shot dead. Other prominent museum objects include some original artefacts used in escapes. After all, help for people wanting to flee the GDR had always been one of the core aims of the Museum during the Cold War years. On display are a number of cars used in such efforts, as well as some truly spectacular and/or ingenious other relics of escapes. For instance there are a couple of light-weight planes used to cross over the Wall by air. Another such attempt was made in a hot-air balloon by two families in 1979. The balloon was laboriously sewn together at home in secrecy and then, after an initial failed attempt, used successfully in what still stands as one of the most dramatic such stories ever. Now parts of this balloon are on display in the museum too. People also managed to flee over, or even under, the sea: one of the most hair-raising artefacts on display in the museum is the mini submarine that one GDR citizen built which pulled him all the way to the West under the surface of the Baltic Sea. Another object of special note as far as the ingenuity in these escape attempts is concerned is a speaker cabinet that a Dutch musician used to smuggle his girlfriend and later wife out of the East. Of course, not all escape stories had such a happy ending. And the failed attempts are also the topic of this museum. Likewise the whole system of repression in the GDR, which too is illustrated with smaller artefacts, as well as lots of photos and documents. One section is devoted to the spying methods of the GDR secret police, the Stasi. Again, specimens of those infamous "scent samples" of yellow pieces of fabric in jars can be seen here (see Stasi exhibition and Stasi museum). A separate wing of the building contains parts of the museum less directly linked to the topic of the Wall and escapes from the GDR. One extensive section here is about art, and it includes some marvellous pieces of communist kitsch too, e.g. Stalin busts, paintings and mosaics. There's also an especially remarkable piece of "booty", a stuffed badger taken from Erich Mielke's house – apparently he even shot the poor thing himself! At the time of my latest visit a few years back I found a whole extensive section about non-violent resistance movements worldwide – from Gandhi (some of whose personal belongings are on display), the peaceful (and not so peaceful) revolutions in the rest of the Eastern Bloc, such as in Poland or Romania, to the latest revolutionary movements in the Arab world from 2011 (e.g. large photos from protests in Cairo). So there was clearly an ambition to remain up to date. Meanwhile, of course, we know that the "Arab Spring" turned out to have largely failed. Back over in the Western world, there's a whole room dedicated to Ronald Reagan! Yes, you can probably guess why: because he once made that famous speech in 1987 right by the Brandenburg Gate in which he urged "Mr Gorbachev: tear down this wall!". To this day too many people misunderstand that mere propagandistic gesture as actually having had anything to do with the fall of the Wall years later. It's a tad disappointing that the Checkpoint Charlie Museum has fallen for that misconception too. Even more disturbing is the full-on unabashed Reagan glorification that overflows in this room, complete with display cabinets containing his cowboy hat, cowboy boots, as well as countless pro-Reagan election campaign badges. Given that it was Reagan who so massively raised the power of the US military-industrial complex like no other president before him, restarted the production of chemical (nerve gas) weapons, initiated the dangerously destabilizing "Star Wars" programme, and often enough behaved like bull in a china shop in diplomatic terms too (remember his "empire of evil" insults? ), it is a bit off-putting to find him portrayed so one-sidedly as a heroic man of peace in this museum (of all places). Back on more familiar territory, the museum also covers the last days of the Soviet Union, especially the failed 1991 coup in the USSR, esp. Moscow. On display is the huge flag in Russian national colours that protesters – with Boris Yeltsin taking the helm – gathered behind as a symbol of their determination not to let the old communist guard have their way. On the other hand, the contemporary political repression in Russia under its new "tsar" Vladimir Putin is also given significant space in the museum. Covered in particular are those cases of assassinated critical journalists, such as Anna Politkovskaya, or the imprisonment of former oligarch and Putin rival Mikhail Khodorkovsky. There was ongoing refurbishment and expansion work especially in this section at the time of my last visit (in November 2011), so it may be interesting to see how this topic will be represented by the museum in the future. The texts and labelling in the museum's exhibition(s) are by and large in four languages: German, English, French and Russian. The order in which they appear on the large text panels varies, apparently at random. A few bits of the older parts of the exhibition occasionally lack the Russian version (and have generally a more cobbled-together feel than the more recent additions). The quality of the translations into English is overall OK.
More general background information about the museum's main themes is provided by various short documentaries shown on a loop as well as longer films that can be viewed in the museum's cinema. There's also a library that is open to the public (upon prior registration). The museum's shop sells all manner of the usual Wall memorabilia including T-shirts, books, postcards, and (allegedly) original little concrete pieces of the Berlin Wall itself. More souvenir shops line the streets around the museum. In fact, the commercialism that has developed here can be a bit overwhelming and certainly detracts even further from any trace of authenticity the place may still exude. As if to counter all this more or less cheap commercialism, there are now long walls with information panels lining several streets around Checkpoint Charlie. Instead of riding the sensationalist bandwagon even further, these panels make a much more sober, historically informational attempt, including some remarkable photos, but also some rather "elementary" information that's more for beginners and will likely bore visitors who are already halfway familiar with the story of the Cold War and the Berlin Wall. In addition, however, they also provide information about many (though not all) of the various other Wall-related points of interest in Berlin (all of these, and more, are also covered here – see under Berlin Wall). If you're new to Berlin and the whole topic of the former border, then these information panels are surely a very good starting point, from where to take your Wall sightseeing further. Location: Right in the centre of Berlin at and around the intersection of Zimmerstraße and Friedrichstraße. The Museum's address is 43-45 Friedrichstraße. Access and costs: easy to get to; open-air area free, museum a bit pricey. Details: The place is so centrally located that it can be reached most easily – by public transport and/or on foot. The nearest metro stations are Kochstraße (U6) and Stadtmitte (U2). Or take the useful bus line M29 (to the Kochstraße/Checkpoint Charlie stop). The outdoors "exhibits" and the information panels in the open air are freely accessible at all times. The Wall Museum, on the other hand, levies an entrance fee of 12.50 EUR, which isn't exactly a bargain, but you have to remember that this is a privately run museum (and there are reductions for students and for groups of 20 people or more). Guided tours can be arranged in advance, but are, frankly speaking, not really necessary. Most things are perfectly self-explanatory. Texts are generally in German, English, Russian and French. The Museum's opening hours are exceptionally generous: every day of the year (!) from 9 a.m. to 10 p.m.! Time required: That very much depends … if you want to see everything, study all the texts in detail and watch every minute of the films on offer in the museum, you can spend a whole day in here (and quite possibly more). Most people, however, will be selective and spend between less than one and maybe two hours in the museum, plus a few moments outside. 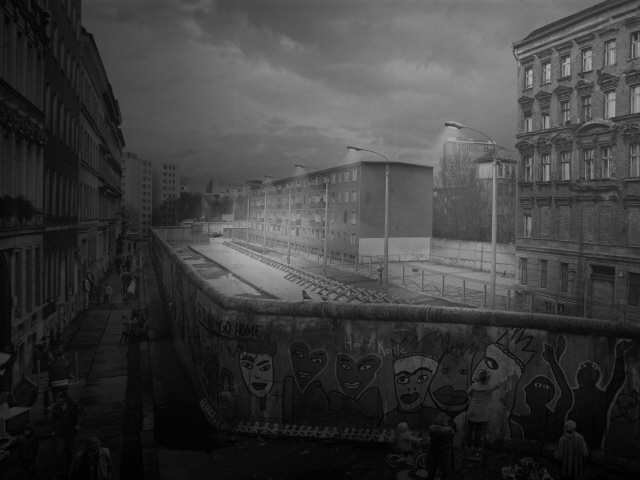 Combinations with other dark destinations: The area around Checkpoint Charlie has become intensely "touristified", and a lot of that revolves around the Wall and Cold War history. Just to the north there's a new round building that inside features a Wall "panorama" to give visitors a life-size impression of what the Wall looked like in the 1980s. Across the street is a new Cold War museum (mainly a photographic exhibition). And rows of souvenir shops/stalls sell Cold-War and Wall-related stuff. All in all it can get uncomfortably busy here. The exhibition 'Topography of Terror' and the Wall remains at Niederkirchnerstraße are literally just round the corner. En route you also pass the new location of the reworked Stasi exhibition. Also not far is Potsdamer Platz with the nearby surviving Wall watchtower. To the south of Checkpoint Charlie, the Jewish Museum is a short walk away near the bottom of Friedrichstraße on Lindenstraße. In the other direction, north along Friedrichstraße, you get to the main boulevard Unter den Linden, where the 'Berlin Story' shop is located. Public transport also allows good access to many of the other dark attractions Berlin has to offer. Combinations with non-dark destinations: generally see Berlin – in the immediate vicinity, Potsdamer Platz to the west with its glitzy modern architecture has become a tourist attraction in its own right. Further along to the north, Friedrichstraße also takes you to the central boulevard of Unter den Linden, which connects the Brandenburg Gate with the Museum Island. The central location at Friedrichstraße and good public transport connections also make for various further possible combinations of a visit to Checkpoint Charlie with other Berlin sightseeing opportunities.